You hoped you had finally managed to kill yourself. But alas - your minions managed to resurrect you and you find yourself once again burdened with the management of a kingdom. Or, well, yourself... only your eyeball, to be frank. 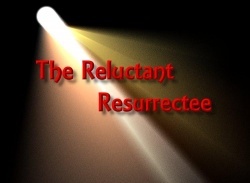 The Reluctant Resurrectee (David Whyld; 02-Apr-2007; ADRIFT 4). Spring Thing 2007: 2nd place of 4 entries. InsideADRIFT Game of the Year Comp 2007: 2nd place of 6 entries. XYZZY Awards 2007: Finalist for Best Individual PC (the king). Or download rking%20(graphics).taf from springthing.net's mirror. Beta-testing by C. Henshaw, Max, Richard Otter and Nick Rogers. Or download rking%20(no%20graphics).taf from springthing.net's mirror. Or download SpringThing2007.zip from springthing.net's mirror. The Reluctant Resurrectee (archived) - at Baf's Guide. See also: Delron review compilation by various reviewers. Review - by Emily Boegheim. My Spring Thing notes - by Daphne Brinkerhoff. Review - by J. D. Clemens. Review - by Emily Short. This page was last modified on 17 May 2018, at 21:20.